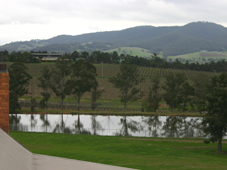 Touring the Yarra Valley wineries and Yarra Vally wine tours are one of the most popular Melbourne day trips. The Yarra Valley is known for its fantastic wines, is a feast for the senses and a must when you travel Melbourne Australia. These Victoria wineries are also a Sunday treat for many locals, an ideal place for special lunches and romantic getaways. 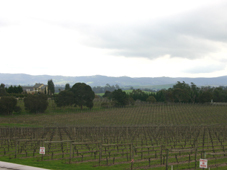 The wine region of the Yarra Valley is only about one hour northeast of Melbourne. Funnily, you don't see the Yarra much. It is only a stream, but the valley is spacious, open and stunning in front of the backdrop of the Victorian highlands. The Yarra Valley was the first Victorian wine growing district 170 years ago. However, it did not survive the 1930s economic depression years and it has only been since the 1960s that wine making has come back to this region. With the boom of Melbourne into a cosmopolitan world class city, it has become one of Melbourne's stylish places to visit. There is an abundance of Yarra Valley wineries, estates and local food - more than 70 wineries around Warburton, Healesville, Yarra Glen and the village of Marysville. They produce the world famous cool climate Yarra wines, which you can get served at cellar doors, together with gourmet cheese platters and local produce, like berries, stone fruits, salmon or trout. The beauty of this region has attracted many local artists and art galleries that add to the aesthetically pleasing environment. Then there are day spas, vineyard dining, mountain retreats, cafes, restaurants, in short, feasts for the senses. There is also the native wildlife park, the Healesville Sanctuary, and a fun park of Hedge Mazes for kids of all ages, as well as sunrise balloon rides if you are looking for something very special. How to Organise Your Wineries Tour? You can self-drive and design your own visit of the Yarra Valley wineries. 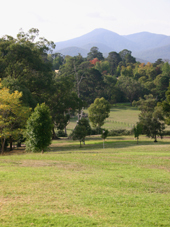 Travel to the region via the Maroondah Highway. Just allow plenty of time to explore. We tend to visit the Tarra Warra Estate with its adjoining museum of Modern Art, where you can see some of the iconic Australian works by Albert Tucker and Brett Whiteley, and have fallen in love with the ambience of the areas along the Melba Highway and the Healesville Yarra Glen Road. A very good alternative is to take advantage of one of the many organized Yarra Valley wine tours. There are different tours for different budgets, stopping at different wineries. That way you dont have to think or plan, but just enjoy. There are some exclusive and intimate wine tours, even some in a Bentley, and others for the more budget conscious traveller. Following are a few of these wine tours that mostly leave from Melbourne. We will list more of these in the future. If you are a winery and wish to be listed, please contact us.